Osh Kosh B'Gosh Employees circa 1944. The two men standing on each side are wearing the one-piece camouflage suits that Osh Kosh B'Gosh produced for the Army during World War II. 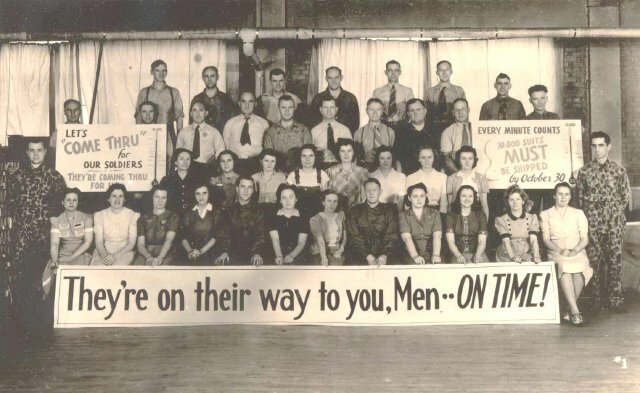 The two men in the front row are also wearing Army 1st pattern one-piece herringbone twill work suits or coveralls (possibly also made by Oshkosh B'Gosh). 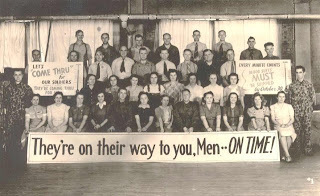 They are seated on bleachers behind a sign reading, "They're on their way to you, Men...ON TIME!". A sign at left reads, "Let's come thru for our soldiers / They're coming thru for us." and a sign at right, "Every minute counts / 10,000 suits must be shipped by October 30."